When you work out, your muscles do their job by pulling on your bones, which function as levers to create movement. Levers can be classified as either first, second or third class. Most exercises use third class levers, which are the most common in the body, but a few employ first and second class levers. A lever is a rigid structure, such as a bar or bone, that rotates around an axis, termed the fulcrum. In your body, muscles supply the force to move your bones, which rotate around fulcrums located at your joints. The weight your muscle has to overcome -- whether that of a a limb, your whole body or an external weight such as a barbell or dumbbell -- is termed the resistive force, or simply the resistance. Levers are classified according to the relative placement of the fulcrum, resistance and force. In a first-class lever, the fulcrum is located between the resistance and the force. A seesaw is a first class lever. First class levers in the body are rare, and few exercises utilize them. Examples, however, are exercises that require elbow extension, such as dumbbell triceps extensions, cable triceps push-downs and triceps dips. In each of these exercises, the elbow joint serves as the fulcrum, which lies between the resistance and the force applied by the triceps muscle behind the elbow. Second-class levers also are fairly rare in the body. In a second-class lever, the resistance lies between the fulcrum and the force, as in a wheelbarrow. Exercises that require extending the ankle, such as seated or standing calf raises, employ a second-class lever. In a calf raise, the resistance -- the weight of the body -- is positioned between the fulcrum at the toes and balls of the feet, and the force, which is applied by the calf muscles pulling on the heel. Push-ups also utilize a second-class lever. Most levers in the body are third-class levers, in which force is applied between the fulcrum and the resistance. A shovel is an example. 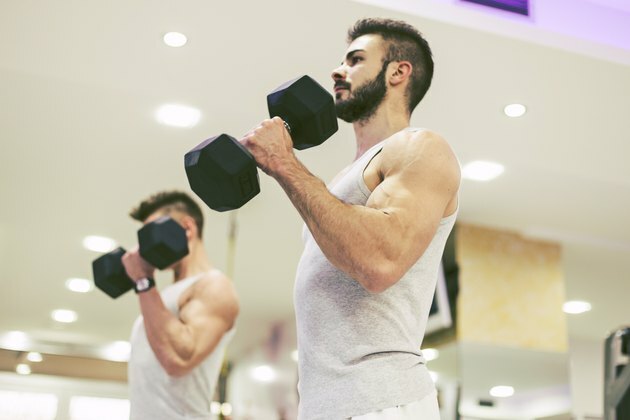 Biceps curls employ a third-class lever, with the force being exerted by the bicep muscle between the fulcrum at the elbow joint and the weight in your hands. Other examples include seated and lying hamstring curls, seated leg extensions, dumbbell flies and shoulder dumbbell front and lateral raises.